The Blues Club will hope that their record this season – which is almost identical to the one they held at this time last year – is a good omen. 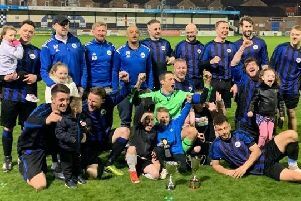 Last season the Gainsborough side went on to win the Lincoln Saturday Football League. This time round, they find themselves one place lower than at this stage last season. Their record is almost identical to last season, although they have played one game more this season, which they have won. They have drawn two of their ten league starts and lost just once. In their 13 games played they have drawn twice and lost twice. Their league defeat was against leaders RM Imp and their only other defeat was to go out of the Lincs Junior Cup at the first hurdle to the holders College Wanderers from Scunthorpe. This proved to be their worst defeat, going down 4-2. The Blues Club’s biggest win came on the opening day of the season when they beat Monson FC 8-0. The defending champions have scored 36 league goals, averaging 3.6 per game and conceded 14. In total they have scored 50 in 13 games making them the second highest scorers in the league. Three clean sheets have been kept and 12 players have scored their goals. League leading scorer Lee Bognor has 19, including four hat-tricks, and Leon Shepherd has 11. To make it back to back titles they will have to gain revenge over RM Imp in their home league match and hope other sides also beat them.